This week the final part of the Yosef story unfolds: the most crucial bit which is the unveiling of his real identity. The summary of Josef’s life is difficult reading: his mistreatment, abuse, sold into slavery, the incident with Potiphar’s wife, in prison for 2 years, and at the end of it all was he bitter? No, he forgave and saw that there was a bigger plan unfolding. He realised that his life was not just the sum of his own experiences but was also part of a much bigger plan in G-d that would bring deliverance to His own people. This was not to demean his role; but to realise that you yourself are ‘only’ one more cog is not a bad place to be. It stops you from thinking it all hangs on you but at the same time you realise that the ‘small’ part you play is crucial to the overall picture too. So it was with Yosef. In Bereshit 45:5, 7-8, 50:20 we read that G-d had meant it all for GOOD! How do we equate G-d’s good deeds with suffering and pain? It’s the deeper truth if you can see it. In the daily Amidah we pray ‘You cause death and You cause life’, He is in control of it all. Yosef submitted to G-d’s leading in his life, and it brought him pain and heartache, misunderstanding and rejection, yet ultimately the reasons became clear. His wellbeing or otherwise was less important to G-d than his place in the grand plan. We struggle with this in the ‘me-centred’ culture we live in. Scripture is littered with examples of people for whom their own safety or wellbeing played a secondary role to the will of G-d, and they paid a price for that truth. Esther, refugee from Jerusalem in Persia, an orphan brought up by her cousin Mordechai, chosen because of her natural beauty to be in a harem (which was certainly not as pleasant as popular film images present) and yet in Esther 4:14 we read that it was ‘for such a time as this’ that she had been called. All of her difficult life had been about this one event. She was in the right place at the right time. It was not even a place she personally would have wanted to be in. Consider Daniel: in Shinar Babylon, able to understand the king’s dream, promoted, the ordeal of the fiery furnace, he survives; Daniel is then thrown into the lion’s den – and still he survives! And then he gets promoted. All this made him able to understand the prophetic events unfolding, praying for his people, and recording for us the final events of history! He was in the right place at the right time. Moshe falls into this category too: at 3 months old placed in a basket and sent down the Nile, adopted, away from his own people, assimilated into another culture, he later murders, then gets sent back to face Pharaoh with all the problems associated with that, having to deal with his own feelings of inadequacy etc. But he was G-d’s man of the moment, in the right place at the right time. 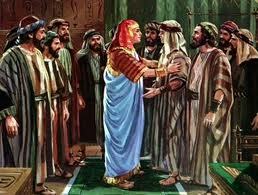 G-d had meant it all for GOOD, as difficult as it must have seemed to the people involved! There are others we can name in passing who were involved with G-d’s plans yet suffered from depression and doubts: Eliyahu and Yonah. Yeshua Mashichenu was no different: He came at the right time (Gal 4:4-5), and didn’t reject the suffering allotted to Him (Matt 26:39, Hebrews 12:2). We might call this lifestyle pattern ‘pain with a purpose’. Yeshua’s pain at our sin is real, just as was the death and agony on the execution stake. However, the emphasis through all this so often is TIME. His timing is always right, we push and shove to make things happen, struggle with issues that take too long to achieve, yet in all things we find His timing to be perfect. It can be asked, if Yeshua came at the right time, why didn’t our people accept Him as Messiah? Certainly one reason is because He also wanted those of the nations to respond to G-d. It was at the right time indeed, but our people failed to receive Him. Yosef told his brothers that they would bow down to him, and at the right time they did. So too will all Israel bow down to Yeshua Mashichenu. But having got Israel to the point of starvation due to famine, to where they desperately went to Egypt to survive, the last step was different. Once Israel was at her lowest point, Yosef asked them to step towards him and ‘come near’. The last step was important for the brothers as they suddenly could see who he truly was. You can only see who He is by drawing close. This revelation of who was before them led directly to their deliverance from certain death. So too will it yet be with our people. Yeshua will be revealed to all Israel again. We hope and pray that it will not have to be at the lowest point again. In us too we should see this pattern of ‘pain with a purpose’; what He has begun, He will finish in us, read Phil 1:6, 2 Cor 4:17 and Rom 8:18. So often our lives feel as if they are hallmarked by grief or pain or events we just can’t understand that seem designed to cause us aggravation, yet the final picture emerges later on. We need to be in the right place at the right time and then we shall find our lives hidden in His. Our purpose and meaning for life becomes clear.